Specialists of “Markinvest Oy” Company provide services for customs processing and certification on the territory of Customs Union, in Russia, Kazakhstan, Republic of Belarus and Ukraine. “Markinvest Oy” consulting agency has been operating in the field of customs processing and certification in Russia since 1993. “Markinvest Oy” trains, consults and certifies hundreds of companies and export organizations operating in global market. Today “Markinvest Oy” performs certification for Finnish, Swedish, British and other companies for import and sales, as well as commissioning of goods and equipment in Customs Union, Russia, Kazakhstan, Belarus and Ukraine. Our customers pass certification, training and get specialized services and certificates EAC, GOST R, GOST К, BelST and UkrSEPRO and other required documents in Finland. The scope of our services includes performance of testing and expertise by specialists at different production facilities in different countries of Europe, Asia and USA. Top level of certification in Customs Union is certification of conformance to Technical Regulations of Customs Union. If no technical regulation is applied to the products, the necessity of certification should be verified at national level. • We provide consulting on export and help to make out with logistical solutions and supplies in complex situations, contact customs and recipient of designation country, clear out any non-conformances in documents and make corrections, and help to choose customs code. • We perform professional translations for certification and declaration, in particular we translate operation instructions, documents, advertising leaflets, web-sites and press releases. 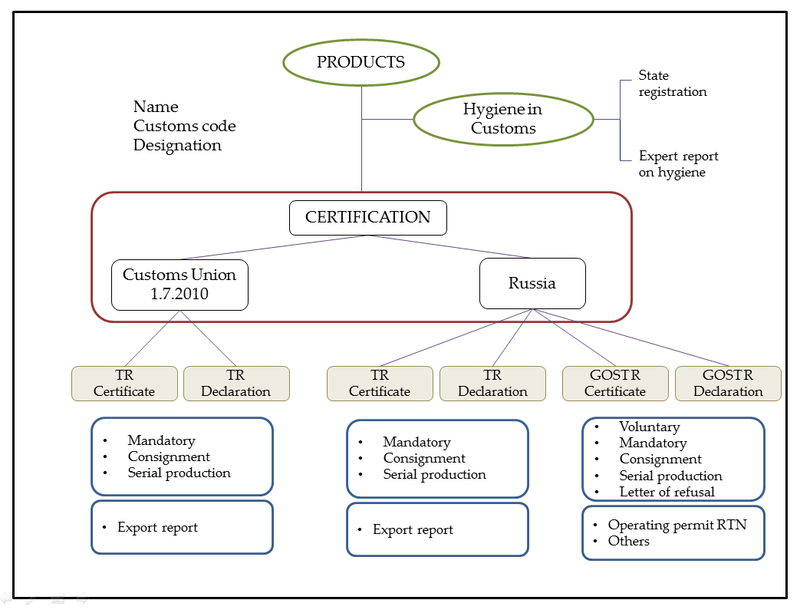 • State certificate about registration of products or Expert report – they replace previous national sanitary and epidemiological inspection reports and are issued by authorities operating on the territory of Customs Union. • Documents required for Rostekhnadzor (RTN) or expert report – national document for the goods thereof Certificate TR has been issued and operating permit RTN is not required. • Certificate of conformance Rosstroy – voluntary certificate, but often required by the customer and officials. Certificate of Rosstroy certifies quality and safety of construction materials. A respective Technical Regulation will be adopted at the level of Customs Union. • Certificate of explosion-hazard protection – Certificate of conformance to Technical Regulation of Customs Union certifies that products are made as explosion-proof. • Fire safety certificate – national certificate of conformance to Technical Regulation certifies that goods and materials meet requirements of fire safety. • Approval of type of measurement tools – formal certification that a certain type of measurement equipment is approved and included in State register. • Registration of medical equipment and drugs in the Ministry of Healthcare of Russia and Kazakhstan. - other certificates of the company and goods.